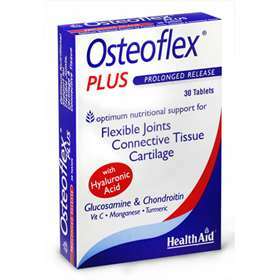 Health Aid Osteoflex Plus are prolonged release tablets to support joint health. Osteoflex Plus Contains high grade Glucosamine, Chondroitin Sulphate and Hyaluronic Acid along with Manganese (associated with bone health) and Turmeric (which can ease the pain and stiffness of joints). Contains high grade Glucosamine, Chondroitin Sulphate and Hyaluronic Acid. Also has added Vitamin C, Manganese and Turmeric. Helps natural support joint health. Suitable for adults and children over 12 years of age. Take 1-2 tablets daily with a main meal. Do not exceed recommended daily dose unless advised by a suitably qualified person. If you are a diabetic consult your doctor before taking this product. Glucosamine Sulphate (2KCl), Chondroitin Sulphate, Bulking Agent (microcrystalline cellulose, di-calcium phosphate, maltodextrin), Vitamin C (ascorbic acid), Glazing Agent (PVP), hydroxyl propyl methyl cellulose (HPMC), Hyaluronic Acid, Anti-caking Agent (veg. magnesium stearate), Curcumin 10:1 Extract from turmeric (Curcuma longa), Manganese Sulphate.